Recently I posted about a McLaren I saw parked on the street and shared it’s specifications and performance figures. I personally love to read about cars and I follow all news related to the auto industry. Because of this I figured that once a week I’d post something about the coolest thing I’d read that week for a new segment on cars. 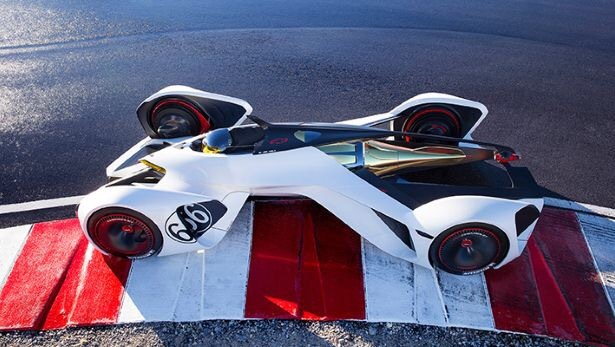 To kick things off for my new segment I’ll introduce you to the Chaparral 2X Vision GT (pictured above). This concept from Chevy isn’t “real” even though they’ve fabricated a physical model for the LA Auto Show. For the release of the new Gran Tourismo racing video game the developers asked all the major car manufactures to send them a concept they could bring to life within the game. This is Chevys entry and it’s by far the coolest thing I’ve seen in a while. It’s proposed propulsion system employs a 671kW laser that’s powered by Li-ion batteries and an air-powered generator to produce approximately 900 hp. Apparently the laser “pulses beams of light that focus in a shroud, to create shock waves that generate massive thrust.” Unfortunately I’m not educated well enough in physics to comment on the plausibility of its power train but it’s fun to think that in a few decades all cars will adopt that sort of technology. Another cool aspect of the concept is that the driver of the vehicle is required to lay down flat in order to operate it which Chevy says “enables progressive strategies of active and driver adjustable aero.” Wicked. And to top things off its theorized that it’ll do 0-60 mph in 1.5 seconds and onto a top speed of 240mph. While this all seems like science fiction now, who knows, in a few decades this could be the normal for Formula One and a few decades after that maybe even the normal for consumer cars. For more info on the car click here. This entry was posted in Uncategorized and tagged Cars, Concept, lehigh university. Bookmark the permalink.